The Grey House, a private residence in Batheaston, haunted by an old lady in a purple dress, the house’s former owner, who appeared to gardeners, as it was her favorite occupation. At Dunluce Castle, Portrush, a man in a purple cloak haunts the towers of the castle. Burley, New Forest 26 December 20015 While driving around lost, looking for a road sign, a couple passed a patch of purple / blue smoke, around 2 metres by 3 metres in diameter, hovering around 2 metres off the ground. They drove back to have another look, but the smoke had gone. From a dress historian’s point of view, I find this puzzling. So many ghosts arise from the Victorian era, that heyday of painfully vivid aniline dyes such as mauveine. It was not, as in Roman times, an expensive and rare color and, realistically, we would expect to see more heliotrope hauntings from the Woman in Mauve. Yet, in riffling through the ghostly wardrobe, we find only a classic phantom hitchhiker story in “The Lavender Evening Dress,” (sometimes retold as “Lavender.”) from The Screaming Ghost by folklorist Carl Carmer. Augustus Hare also shared a story of a ghostly woman in a lilac-print gown. 9TH CASE, OR SERIES OF CASES.-COLORS FOR LUNACY. Many of us are familiar with the cursed blue-hued Hope Diamond. Britain has its own version in the cursed Delphi Purple Sapphire, which is actually a brilliantly colored amethyst. A brief summary is found in this paragraph, while a more detailed description of the havoc wrought by the “cursed gemstone,” is found here. Credit: Natural History Museum The Delhi Purple sapphire is another imposter, because it isn’t really a sapphire, but an amethyst, which is a type of violet-hued quartz. The mysterious stone is rumored to have been stolen by a British solider from the Temple of Indra, the Hindu god of war and weather, in Kanpur, India, during the Indian Mutiny of 1857. It was brought to England by Colonel W. Ferris, whose family then supposedly suffered many financial and health woes. The stone was given to Edward Heron-Allen, a scientist and writer, in 1890, who claimed to have started having bad luck immediately after receiving it. He gave the amethyst away to friends, who were also struck with misfortune and quickly returned the gift back to him. Heron-Allen warned that the Delhi Purple sapphire is “accursed and is stained with the blood, and the dishonor of everyone who has ever owned it.” Wary of its alleged powers, he kept it locked away in seven boxes and surrounded by good luck charms. 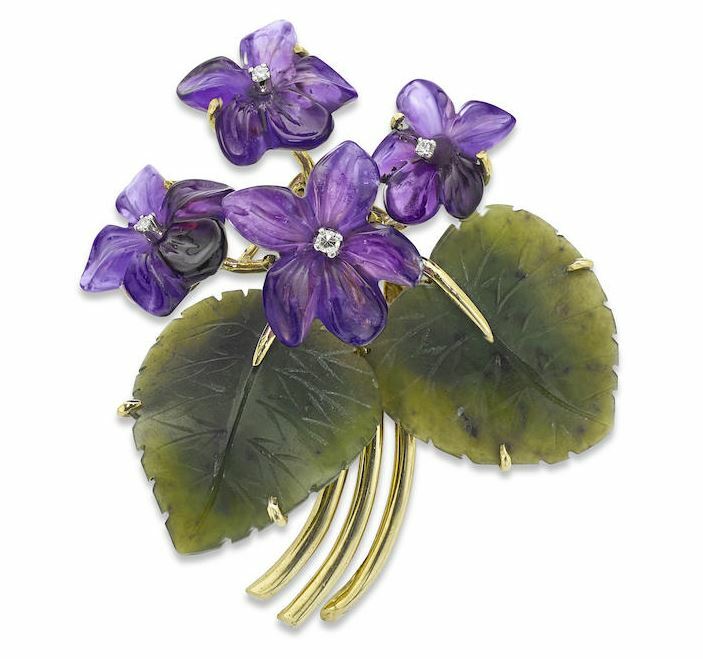 After his death, Heron-Allen’s daughter donated the amethyst to London’s Natural History Museum in 1943. Along with the stone, she gave them a letter that her father wrote cautioning future owners against directly handling it. The mysterious Delhi Purple sapphire is now permanently on display as part of the Natural History Museum’s Vault Collection of precious gemstones. She crossed Woolwich Common, visited the Arsenal, returned to the barracks, and then found herself in the bedchamber of an intimate friend. Miss L. M., who lived at Greenwich. She began to talk; but she remembered no more until she waked by her husband’s side. Apparently the wandering soul showed its “true colors” when out of the body. In the Occult Review of May,  W. F. T. asks if any explanation can be given of the cross of purple seen on a wall. Of course some may think it was a warning of the death of the King (purple being the Royal colour for mourning), but I think I can give a very prosaic explanation. When one looks at anything steadily for a few minutes, especially anything which is against the light, the image of that object is retained, in its complementary colours, for some time, and if one looks at a blank wall that image comes and goes several times just as explained by W. F. T.
As the image seen was that of a purple cross, W. F. T. must have been looking just before at some light yellow object in the form of a cross, either a gilt cross or a gilt picture frame which had a crossing of its sides, or most likely of all, had been looking out of the window. The fact that it was ” wet and gloomy, the sky a dull leaden grey ” would, the cross-bars of the window being cream colour, give a deep violet cross on a grey ground if the window was first and then the wall looked at. A blue sky would have given an orange background, but grey does not have a complementary colour (it is the only colour, or rather lack of colour, which does not), therefore the background would remain a light grey and be unnoticed. Would W. F. T. kindly try this experiment and report results? King Edward VII died on 6 May 1910. Unfortunately the database for The Occult Review did not have the May 1910 issue with the original vision. Are spooks playing “hob” with farmers in the vicinity of Hetzler’s corners? Or is some practical joker, with a remarkable amount of cleverness, working on the minds of imaginative farmers in that neighborhood? About 7:30 o’clock James Covault, a tenant on the Robert Patterson farm north of Fletcher on the Snodgrass pike, stepped out into his yard and he saw a purple light which seemed to be burning brightly on the pike about a mile west of his house. He called the other members of the family and they decided that some farmer had painted his lantern a brilliant purple for a novelty. Suddenly the light began moving rapidly toward the Covault house, advancing by spurts, but at times apparently receding. As it came nearer, almost with the velocity of an electric flash, it assumed the size of a headlight on an automobile. When the end of the lane to the Covault home was reached the light was so bright that the people could plainly see the barn and the cattle in the barnyard. Here the light halted, and while the family was discussing the nature of the phenomenon it suddenly left he pike and began traveling northward with incredible speed across a field in the direction of C.C. Moore’s farm buildings. By the time the purple rays struck the Moore dwelling the light was so brilliant that Mr. Covault says he could see the house and shade trees as plainly as if it had been daylight, although they were over a mile away. At the Moore house the light suddenly vanished as mysteriously as it came. G.W. Sanders and Mr. H.P. Morgan were other observers of the weird light. Mrs. Sanders thought a building must be burning until she noted the color and quick flashings of the light. She now agrees that she was mistaken, and the entire community is much puzzled. Our final look at purple in the supernatural record is an excerpt from the “Grave Errors” chapter of The Victorian Book of the Dead about a ultra-violet end to a Brooklyn lady’s corpse. The story is narrated by the deceased’s nurse who claimed to witness these events. “But you have not told me how the flame from the lady’s body was extinguished. Finish that, will you? “ said the invalid, with increasing irritation. “Oh, it burned out; the doctors were at their wits’ end, when the water made it worse. The curious detail that water did not extinguish the Brooklyn corpse-blaze, but fueled it is a near-constant in stories of Spontaneous Human Combustion. The theme of intoxication is also a common one–the Temperance movement actually used the threat of SHC as one of their deterrents. Other violet visions or shades of purple? chriswoodyard8 AT gmail.com, who has apparently looked too long on laylock. Previous posts in this series were Cats of Many Colors, The Quick and the Red, Orange You Scared? Yellow, Kitty! Green Jean Seen, and Shades of Blue.